Free Shipping Included! ORANGEMONKIE [Foldio1] Portable mini photo studio 10 inch photo shooting tent lighting box by Foldio at Marco Marcucci. MPN: M0200R. Hurry! Limited time offer. Offer valid only while supplies last. Foldio = Foldable Studio Design for use with smartphones, tablets, DSLRs and compact cameras. All in one studio includes backdrops, light and power. 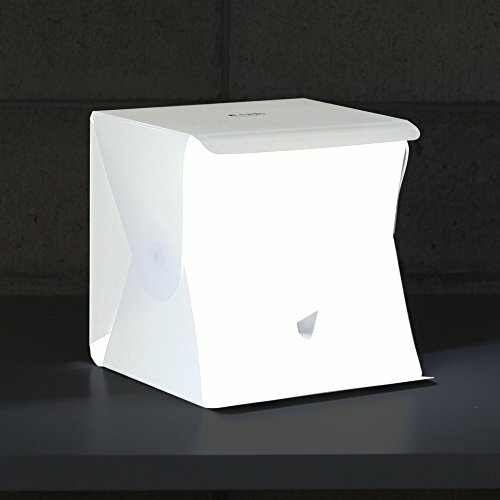 DESIGNED SIZE & PORTABILITY - Foldio's unique design allows the photo studio tent to be folded down thickness of 1" and carried by its convenient handle. In addition, its own magnetic structure enables users to assemble the photo studio box in 10 seconds and make sturdy shape for extensive use. LED LIGHTING SYSTEM - High performance built-in diffuser LED light strip applied on the top of the photo studio. It's designed to decrease shadows of subjects more efficiently. LED strip gives great setting for the lighting box. FOLDIO APPLICATION: Download free Foldio application. Improve your product photography with the Foldio app! Through the app, you can do Chroma key, easy control of brightness and color temperature, Editing function and sharing on your social media! If you have any questions about this product by Foldio, contact us by completing and submitting the form below. If you are looking for a specif part number, please include it with your message.